As with all of these topics, it helps to first define what music theory is. 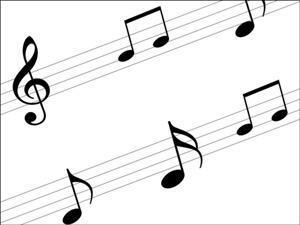 Music theory is the study of all the elements that make up music, the most basic of which are rhythm, melody, harmony, and notation. In a classroom setting, I consider basic music theory to be note-reading and the knowledge of common musical terms. Rhythm: The arrangement of sounds in time. Terms relating to rhythm include time signature, meter, measure, bars, and beats. Melody: A series of pitches that sound in succession. Terms relating to melody include pitch, notes, interval, octave, major, minor, and key. Harmony: This occurs when two or more notes are played at the same time or in quick succession. Terms relating to harmony include chord, consonance, and dissonance. Notation: It’s the written notes that represent at piece of music. Related terms include bass clef, treble clef, staff, grand staff, notes, and time values. Definitions for all of these terms can be found here at this Glossary of Musical Terms. For more detailed explanations, Wikipedia is quite helpful. If your children study an instrument, or play one in the classroom, music theory is built-in to this activity. Beginner’s books for piano, violin, recorder, etc. teach different note values and terms when introducing songs that contain those notes or terms. This is a very effective way of learning theory, because you’re getting a chance to experience the concept personally. An example would be learning the term “forte” and then playing a song that has a section to be played “forte” (loud). There are lots of ways to work music theory into the classroom experience. For example, you could use a musical term as a bonus spelling word, and have the kids tell you what it means (or look it up in a dictionary if they don’t know offhand). Kids can make their own vocabulary matching cards by writing up definitions to musical terms and matching them to the correct term. Doing all the activities that I’ve mentioned in all the previous music posts are also ways for kids to learn music theory. Learning to read music is an important skill. There are lots of ways to go about this, but a simple way is to draw 5 lines on a chalkboard or dry erase board and then draw in one note and teach its name. Do this every day for one week, then review the 5 notes. This site has clear outlines of the clefs and notes, as well as common mnemonics for aid in memorization. In my day, we used “Every Good Boy Does Fine” for the lines on the treble clef, but for gender neutrality the new one is “Elephants Get Big Dirty Feet”. For older kids, have them draw 5 parallel lines on a piece of paper, then use checkers or coins to put “notes” on the lines and spaces. They can point to each note and say its name, and then sing (using “la”) or play their melody.